• 30 gr cocoa powder. In a large bowl, beat butter and sugar until creamy. Beat in the egg yolk. Combine the flour and cocoa powder and add them to the butter mixture. Mix in until it just comes together. Roll out the dough or form it just pressing it with your fingers into 6 8-cm rings laid down on a paper lined baking tray. Fridge the tarts shells for an hour to set. Meanwhile preheat the oven to 180º C. Prick the tart shells all over with a fork and blind bake until cooked through, about 15 minutes. Cool on a wire rack. • 15 gr flaked sea salt. In a saucepan, whisk together the sugar, glucose and the water and bring to a boil. Salt can be added at this initial step (skip if using salted butter), but I prefer to add it at the end in order to preserve the salt crystals. Cook without stirring until amber colour, if using a candy thermometer it should reach 180º C . Remove the pan from heat and whisk in the butter and the cream until smooth. 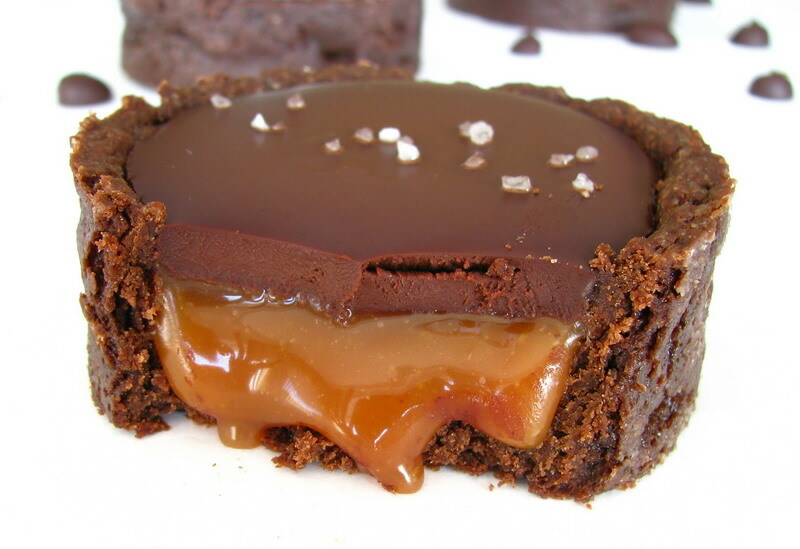 Pour caramel into cooled tart shells and refrigerate until firm, around 4 hours. Bring the cream to a simmer. Then pour the hot cream over the chocolate. Wait for a minute, then stir to obtain a smooth ganache. Pour the ganache evenly over the tarts and refrigerate for further 4 hour. Before serving sprinkle with sea salt, but not before as it will melt away.